I participated in this back in June 2010. 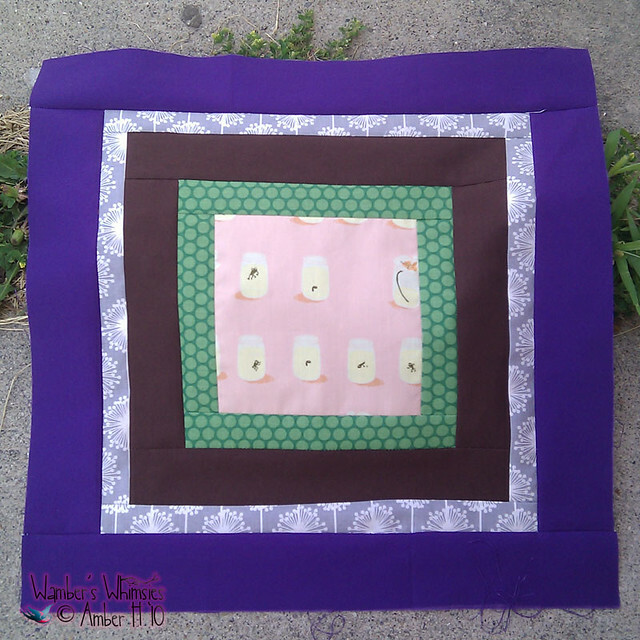 This swap consisted of making 101 4.5″ squares following this tutorial, and we got 100 -give or take- back and one block was put into a quilt that would go to charity. This was actually my very first swap that I did on Flickr. I don’t have a picture of the blocks I got back; nor have I done anything with them yet; but that’ll be for someday when I get around to it. 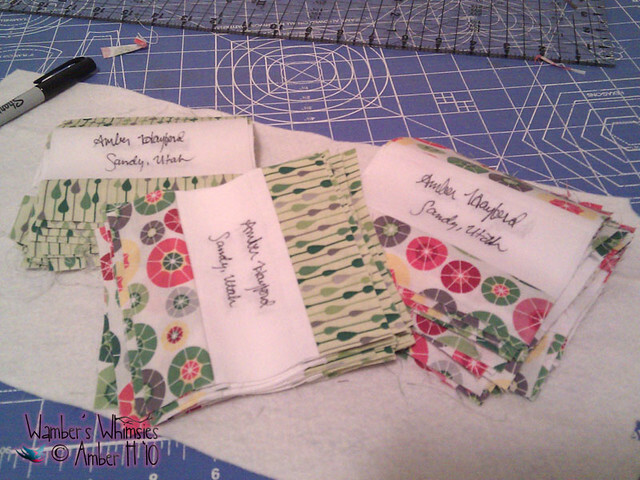 I enjoyed looking at the places where the blocks came from and the fabrics that were used. I participated in this swap back in June 2010 as well; it was running concurrent with the Siggy Block Swap. There’s actually a hilarious story behind mailing the blocks out.. namely I had gone to the post office and purchased the postage using the self serve kiosk, but due to the fact that I was hungry and therefore thinking about food, I FORGOT TO PUT THE POSTAGE on the package! Somehow though, it arrived to the hostess -it was a central swap meaning everyone participating sends their blocks to one person, and they sort and then mail the blocks back out- without any postage and there wasn’t a postage due notice either! It was quite hilarious. The blocks were made using this tutorial; and it was not a set number swap; basically how it worked we sent in as many blocks as we could and we would get back the number of blocks we sent out; in my case I made 24; so I got back 24. My Modified Bento Block before being quartered up. There’s a large variety of sizes and prints here. Mostly Heather Ross, but a couple of Lizzy House and one of Alexander Henry, Erin McMorris -the bird print fabric- and two of some Japanese prints, and even some embroidered ones that I personally embroidered. And of course, I got some hexagons in return.. the gal that had me as a partner is Alexandra who blogs here. 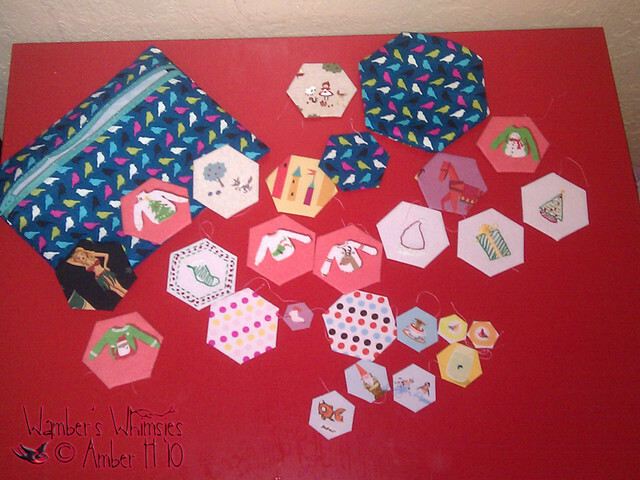 My hexagons, image used with Alexandra's permission. I was pleasantly surprised at how well she hit the nail on the head with her fabric selection; the hexie holder pouch is lined with Anna Maria Horner fabric; who is a designer that I absolutely love and adore.